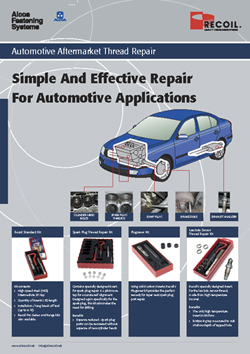 There are thousands of threads in the average motor vehicle which will sooner or later need repair. The Recoil system of high quality wire thread inserts and tooling kits provide a fast, reliable and highly cost effective solution; to repair and strengthen worn threads and extend the life of a vehicle's components. Quick and easy to install, Recoil inserts help to reduce maintenance and keep vehicle downtime to a minimum. The system is suitable for a complete range of automotive applications across cars, motorcycles and commercial vehicles. Quick and easy to install, Recoil inserts help to reduce manitenance and keep vehicle downtime to a minimum. The system is suitable for a complete range of automotive applications across cars, motorcycles and commercial vehicles including: cylinder head, brake caliper, wheel, starter motor and alternator bolts, spark plug threads, sump plug, exhaust manifold studs and the exhaust analyser. An Excel spreadsheet outlining which kits to use for which make and model of car, eg Jaguar X3000, XK8, XJ8 (V8 Models) = M14-1.5 product code: 37148 is available to download HERE.